itsAlyx: A Worm of the Bookish Type. I'm just popping in to tell you one thing - I need your help. I'm going to go out on a limb and assume that each of us enjoys reading. I, for one, love it. Unfortunately, though, I haven't really had much time to read since coming back to the states. In the hopes of making it easier to read on the go, the husband gave me an [extremely] early bday present. You will notice that I love Nicholas Sparks. I could read his books all day, every day. I'm also a huge fan of mysteries and crime novels. 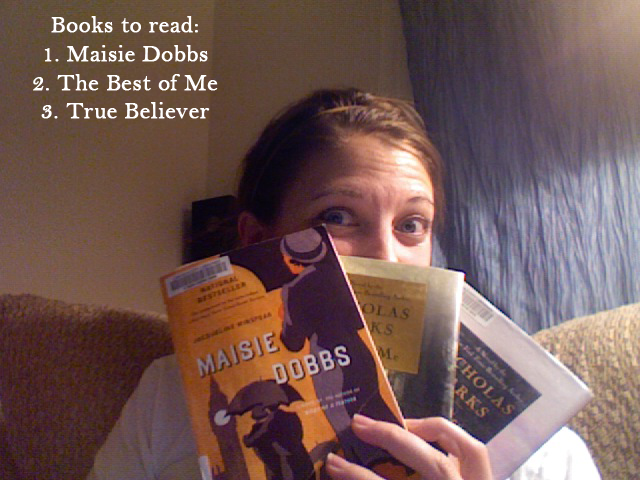 My mom (who is the best resource when it comes to finding a good book) recommended Maisie Dobbs to me, and so far, I'm loving it. I may be jumping the gun, but I can read fairly quickly, and I don't want my list dwindling down anytime soon. Leave your recommendations in the comments. And please - no HP or HG... I'm not that out of touch. Sophie kinsella has some really cute romantic comedies. Warning though, she does use language. I've got your number and can you keep a secret are especially cute. The best of me is soooooooo good!!!!! Did you read safe haven yet? can't wait for that movie! read The Girl With The Dragon Tattoo trilogy for crime-fiction, and yes to Shopie Kinsella for romance-comedy. Her new book called I've Got Your Number. And I'm reading Divergent right now. Haven't done yet but so far I like it. the night circus! my fav book of this summer. There are so many good ones!! For funny murder mysteries, check out Janet Evanovich's Stephanie Plum series. HILARIOUS. Or the Cat Who... series. Not so funny, but very good for such simple writing. For more futuristic like the Hunger Games, check out Matched, Delirium, and Uglies. All three are the start of really awesome teenage rebellion trilogies. For more summer fun, there's the A-List series, Sophie Kinsella books, Kristin Hannah books, or some fun YA series. You should check out the website Goodreads. it's got recommendations as well as reviews and you can add friends to see what they're reading. It's super helpful for bookworms! If you want more recommendations, I am full of them :) feel free to email me at hramp09 (at) gmail (dot) com! I would recommend The Passage by Justin Cronin, The Mortal Instruments series by Cassandra Clare, A Song of Fire & Ice series by George R. R Matrin, The Tudor series by Phillipa Gregory, and The Book Thief by Markus Zusak! Thats enough for now! These are all over the genre spectrum but I have read these over and over and OVER. LOVE them. The Kushiel Series by Jacqueline Carey, His Dark Materials by Philip Pullman, The Historian by Elizabeth Kostova, Savannah Grey by Jim Jordan, The Dark Jewels trilogy by Anne Bishop, and anything by Jane Austen, or JRR Tolkien. Janet Evanovich's Stephanie Plum series is great. They are mystery, a little love triangle going on, and hilarious all at the same time. I'm currently reading Fight Club because I've never read it. If you liked the movie I'd recommend the book, but if you didn't like the movie, you definitely won't like the book. I'm also kind of reading the Game of Thrones (or whatever it's called) series by George RR Martin. I started reading it on my brother's Nook but then had to give the Nook back. I think I'd prefer it in book form through, because it's hard when you can't switch between pages easily (there are a LOT of characters). The Tudor series by Phillipa Gregory is really good. I saw someone else mention them. I really liked this series! gahhh I wish I had time to read at the moment, I miss it so much, but all for a good cause eh! I can't wait until I'm over there, I may live in the library for a while, but it's okay, because my husband (nearly) is a comic book nerd and lives there anyway, haha! Ooooh, congrats on your new Kindle!! I still prefer to read books the old-fashioned way, but I occasionally read them on the Kindle app on my iPhone, too! I try to steer away from series books because I fear committment! :o) Ha! Right now I am reading Lone Wolf by Jodie Picoult and it's good so far! Just finished Kisses From Katie by Katie Davis, too. That one was great - about a teenage girl who went to Uganda after graduation to help the poor there and ended up adopting 14 girls before she was 22! Swedish or Icelandic crime novels by Hakan Nesser, Henning Mankell, Ake Edwardson, Arnaldur Indridason....Love all of them! I really, really liked "The Time Traveler's wife". It's long, though, so you gotta be prepared for that. Love book recommendations! Just read Wild and LOVED it! Or seriously anything by Barbara Kingsolver! Okay well you COULD go onto my blog and check out my book lists. I grade all the books I read so that makes it super easy. OR you should check out this website: http://whatshouldireadnext.com/index.php You can put in the book you just finished and it'll make suggestions based on that. I'm currently reading The Clash of Kings, the second book of The Game of Thrones series and Geek Love, which is not what I thought it was going to be based on the title, but still very interesting. My favorite series are Bloody Jack by LA Meyer (not gore bloody, but British curse bloody) and Uglies by Scott Westerfeld. actually i would recommend the game of thrones series if you're into any kind of fantasy. there are five books (of seven) out so far, and they are really good and will keep you busy for ahwile! im a fast reader too but i think the books are like 3500 pages and it took me from april -- aug of last year to read them all! hah! oh, and my number 1 book recommendation of all time: pillars of the earth!! i'm a huge regency romance fan, and imo you can't do better than jane austen or georgette heyer :3 my new favourite book right now is keeping the castle: i literally cried most of the way through, it was sooo funny. I just checked Best of Me out from the library! Can't wait to read it. Have you read all the funny ones? Tina Fey's Bossy Pants (I'm almost positive you would love it), Mindy Kaling's slightly less funny one, and Ellen's books. They are all really great reads. Yay!! You got your Kindle!! I've read the first 3 on the list, I'll have to check out the rest on your list! Have you even read Blessed Are The Cheesemakers? It's amazinggggg. I'm reading Erica Kennedy's books (saddened after her passing) - I really loved Feminista! 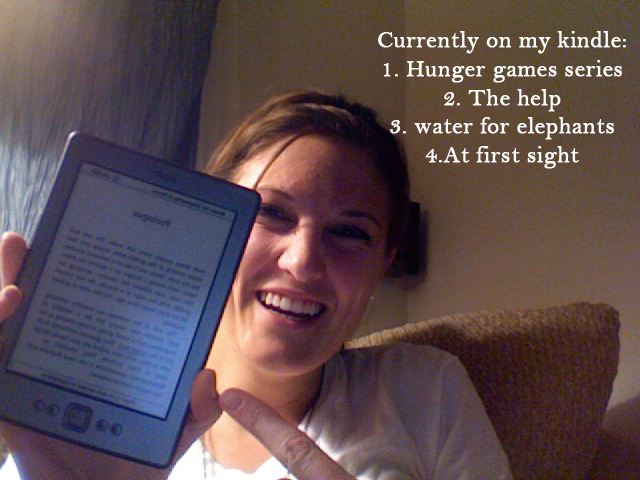 I have a Nook and LOVEE it - and the fact that I can read the books from my Nook app on my iPad too! I LOVE BOOKS OMG! I tend to like more sci-fi fantasy than anything else. And young adult is probably my favorite. If you liked Hunger Games, maybe try Legend by Marie Lu and Divergent by Veronica Roth. I think they both have sequels out by now but I haven't read them yet. I absolutely love Margaret Atwood. Her books are weird but engrossing. I am currently reading "The Penelopiad" and I recommend it! Nice, another Nicholas Sparks fan. I read a bunch of his books a number of years ago but I am actually reading The Choice right now. Aw yeah! I'm sure someone else has said it already, but if you haven't read the Girl With the Dragon Tattoo series you have to. I'm really into historical fiction and my favorite book is The Bronze Horseman. It's the first of a trilogy and it starts in Russia at the beginning of WWII (right when those evil Germans attacked... HA HA!). It's epic, sweeping, romantic, tragic goodness. And my other favorite is the Outlander series by Diana Gabaldon. It's historical fiction/ science fiction/ romance. Basically it's the most awesome thing ever. My dream question! I've been reading a lot of the teen fiction stuff going on. I love the following authors: Iain Banks, Margaret Atwood, Sarah Walters, Barbara Kingsolver & Alexander McCall Smith. I want to read The Night Circus & many more mentioned here, but I'm on a book embargo right now...I have bought a lot! You should definitely do my book club now though! P.S. your hubs is a sweetheart! "Divergent" - it's the first of a three book series. It has a Hunger Game like feel. I just started it but love it so far and my mega bookworm friend raves about teh first and second and the third isn't out yet.